Stewardship, legacy & excellence are key attributes that mark the body of Christ. As we pursue the calling on our house to see movement & impact come to the generation of people on the earth today and for generations to come, we're preparing for the increase, not only of people but of the Presence. Just as David prepared the temple to be the house of God. Join us as we give our home (705 Jackson) a facelift, make her even more beautiful and steward the incredible gift our building is. Our heart and passion is to see people encounter God and be transformed in the presence and we want to remove any exterior roadblocks that would keep someone from an encounter. Would you link arms with us to seeing lasting change come to our village, city, state, nation & the nations? Phase 1 involves putting all new carpet in the sanctuary, reupholstering all of our current chairs to have a fresh, modern look and finishing up the stage redesign. The carpeting and chairs are the first step to beautifying our church and making it feel welcoming (like home) to everyone who comes through our doors. Phase 2 is all new audio and visual media equipment. This would include new screens on the stage for lyrics & graphics, a new soundboard, musical instrument and audio gear as well as cameras and equipment for our media team to capture photos, video & livestream every Sunday. We truly believe that God has given something incredibly unique and special to our house and we want to be able to export it and impact the nations with God's goodness. 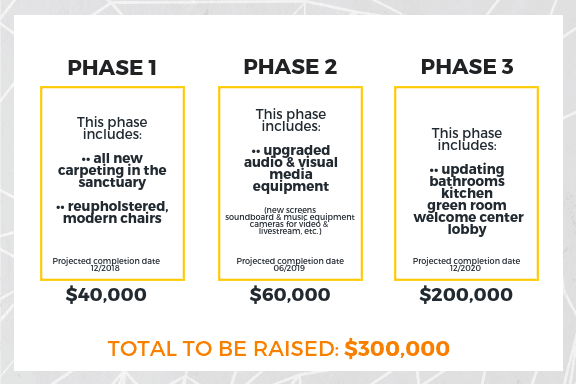 Phase 3 will be the icing on the cake as we remodel our outdated kitchen & bathrooms. We will also update the lobby and create a welcome & information center.